Cell phone use is a primary contributing factor in over a fourth of the serious injury or fatal collisions in Tampa. This statistic includes both hand-held and hands-free devices. Currently, Florida has one of the weaker distracted driving laws in the country. It only prohibits talking on cellphones while driving. Lawmakers may expand the cellphone law to include texting. Even then, the law will have a number of gaping holes and it will not apply to all the device-related distracted driving collisions in Tampa. Legal Violation: Any traffic law, criminal law, municipal ordinance, or other statute could give rise to the negligence per se If the tortfeasor did not violate a criminal law that has potential jail time, such as the DUI law, negligence per se may only be a presumption of negligence instead of absolute proof as a matter of law. Substantial Cause: The legal infraction need not be the only cause of the Tampa car crash, but it must be a substantial There is often a significant difference between the two. Protected Class: The negligence per se shortcut may be unavailable if the legal violation was something like an expired registration sticker or expired drivers’ license, because such laws are arguably not primarily designed to protect motorists. Duty: Noncommercial vehicle operators in Florida have a duty of reasonable care. Taxi drivers, bus drivers, and perhaps Uber drivers are common carriers under the law, so they have a higher duty of care. Breach: Not all distracted driving constitutes a breach of duty. 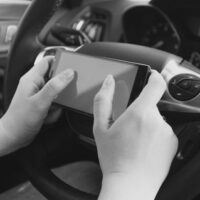 For example, most Tampa jurors would not consider talking to a passenger particularly reckless, even though such action technically meets the definition of distracted driving. Operators who engage in such behavior usually take their eyes off the road (visual distraction) and their minds off driving (cognitive distraction). Factual Cause: There must be a direct link between the breach of duty and the victim/plaintiff’s damages. Proximate Cause: The substantial cause rule in negligence per se cases also applies in traditional negligence actions. Damages: The victim/plaintiff must suffer actual physical injury and/or property loss damages. “Near misses” are usually not actionable in Florida courts. If the victim/plaintiff suffered a serious injury, the damages include compensation for tangible losses, such as medical bills, and intangible losses, such as pain and suffering. There are several available defenses that can either reduce or deny compensation to the victim. Most of them revolve around the principle of comparative fault. Usually, if the judge determines that both parties shared responsibility for the car accident, the jury must apportion damages between them based on the evidence. Unlike most other jurisdictions, Florida is a pure comparative fault state. Victim/plaintiffs are entitled to a proportional share of damages even if they were mostly responsible for the car crash. Victims of distracted driving crashes have several legal options. For a free consultation with an experienced personal injury attorney in Tampa, contact The Matassini Law Firm, P.A. We do not charge upfront legal fees in negligence cases.